It’s little, it’s red, it’s made of card, so there was little point in calling anything else. Although we did, for many years. 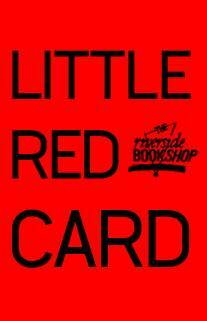 But just us – everybody else referred to it as ‘one of those little red card things’ before rummaging in a purse or wallet. So it is not new (it was formerly known as The Valued Customer Card) and it is not big (it being little) and it is not clever (it being made of card), but it is different and quite remarkably simple: for every ten pound spent you get a stamp (with ink and everything) and when you have six stamps the card is full and there is five pounds off next time. There’s small print (involving National Book Tokens) but other than that its all too easy: no points and no interminable wait before its worth anything, since sixty quid is quite quickly spent. So there you. Ask in store for it. Thank you so much for your help yesterday in finding my bank card. It was safe and sound at Liberty’s. You have a wonderful shop. Happy Christmas to both lovely ladies at the bookshop from the tall couple on Saturday evening.